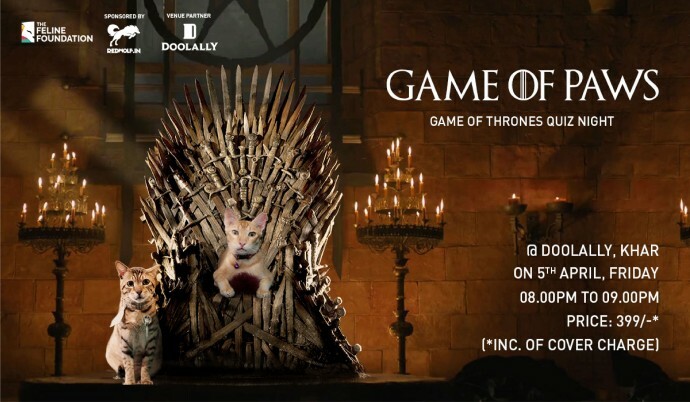 The Feline Foundation in association with Redwolf presents Game of Thrones Quiz Night. Stand a chance to win official GOT merchandise from Redwolf, that is sure to make Joffrey jealous. And that's not it! Every participant will walk away with assured 15% discount coupons from Redwolf and a free beverage from Doolally! If that's not enough, all the funds raised at this quiz, goes to help the cattos that TFF is taking care of! The White Walkers are going to be there. The only question that remains now, will you? Share "Game of Thrones Quiz Night"